A new cafe to the Leederville food scene is Pixel Coffee, which has just opened its doors recently to fellow food and coffee lovers. Pixel Coffee is located along Oxford Street, taking over the previous home of Smuggled Seeds. Hearing a new cafe that has been opened and drooling over Instagram posts, it is a sign that my fellow foodie, Jess from Keep Calm and Just Eat and I to head to Pixel Coffee for our brunch date. Unfortunately, when we arrived we had just missed out on breakfast but we were still excited to try what’s in their cabinet. 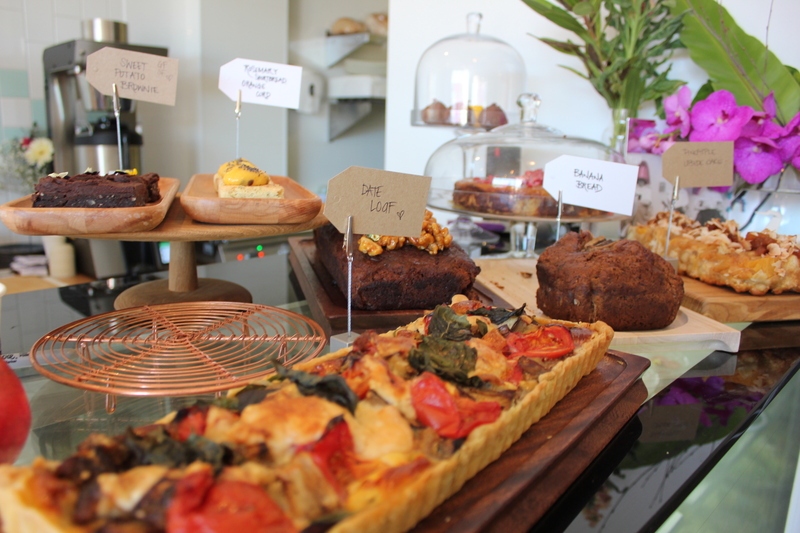 There’s scrumptious salads and sandwiches and a range of baked goodies from cakes to tarts. With recommendations from the one of the lovely owners, Kaya, we went for the Savoury Tart and the Caesar Boat to share. 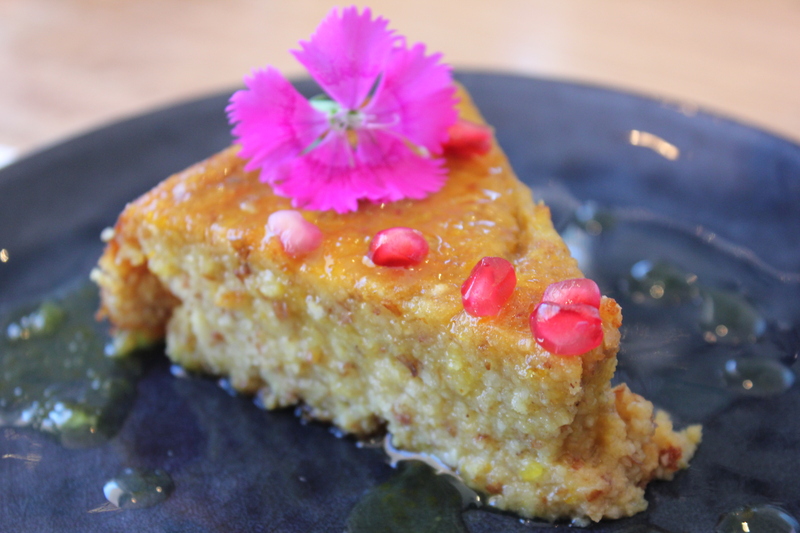 I love how the food at Pixel has edible flowers, making a dish look very pretty. 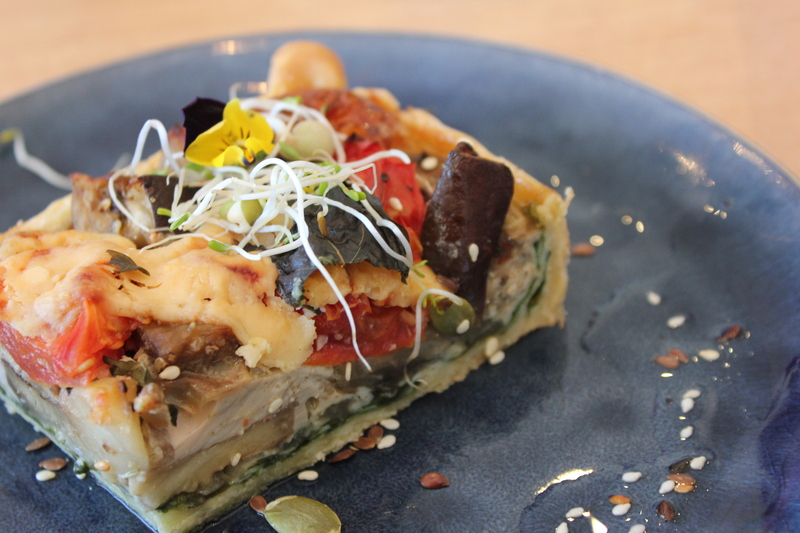 The savoury tart was delicious and it was packed full of fresh ingredients with a perfect pastry. I enjoyed the Caesar Boat too and thought that it was very fresh in flavour. 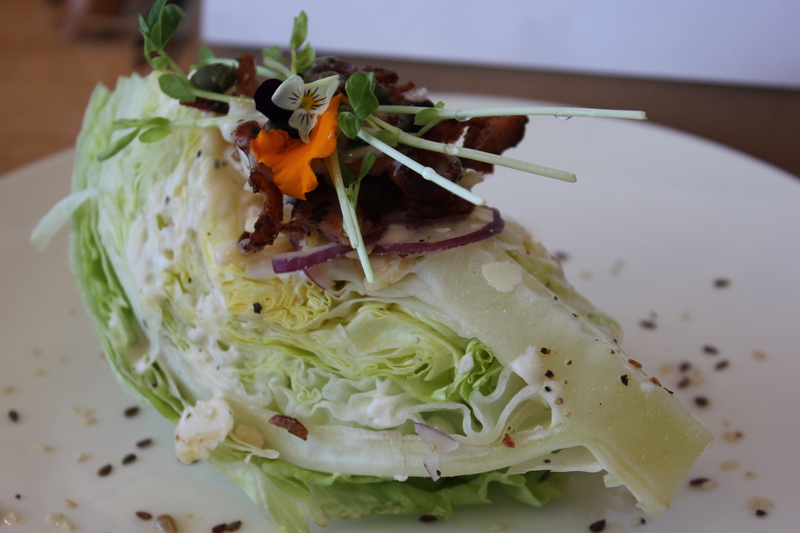 Presentation wise, it’s a different and modern take on the usual caesar salad. To finish, we had the orange blossom cake and raw coconut and chocolate tart. I enjoyed the orange blossom cake and it was very moist and fragrant. There were just so much flavour and acidity packed in the cake. It was just lovely and sensational. 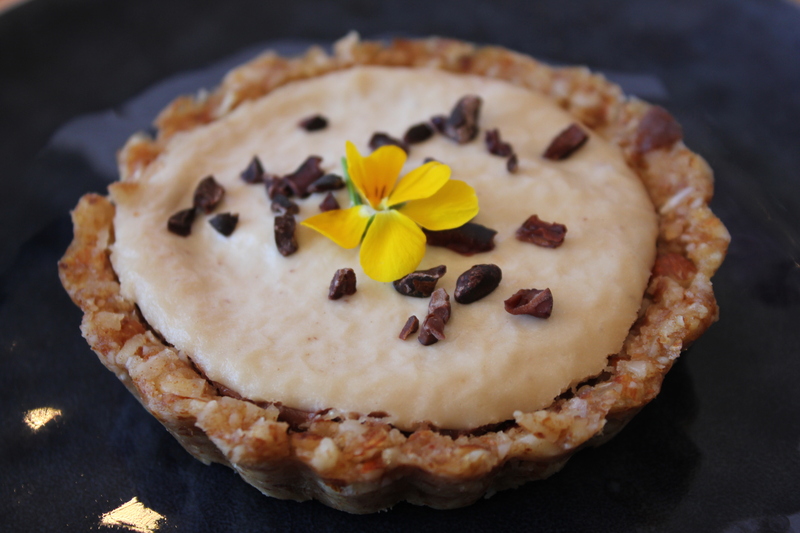 The raw coconut and chocolate tart was pretty good too – lots of subtle and delicate coconut and chocolate flavours. It’s a good choice if you love your raw goodies. On a separate occasion, I decided to visit Pixel again for breakfast after teaching BodyCombat as I had missed out on their breakfast during my previous visit. 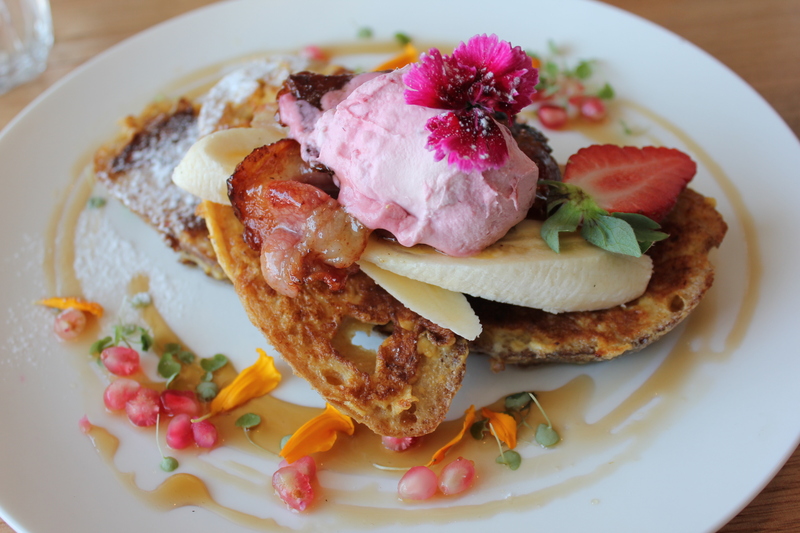 I had the sweet french toast with fresh banana, house cured maple bacon and raspberry mascarpone ($21.90). When the dish first arrived, it was presented beautifully. The french toast was light and fluffy with a hint of sweetness to it, complementing well with the raspberry mascarpone. Overall, the dish was not too sweet. 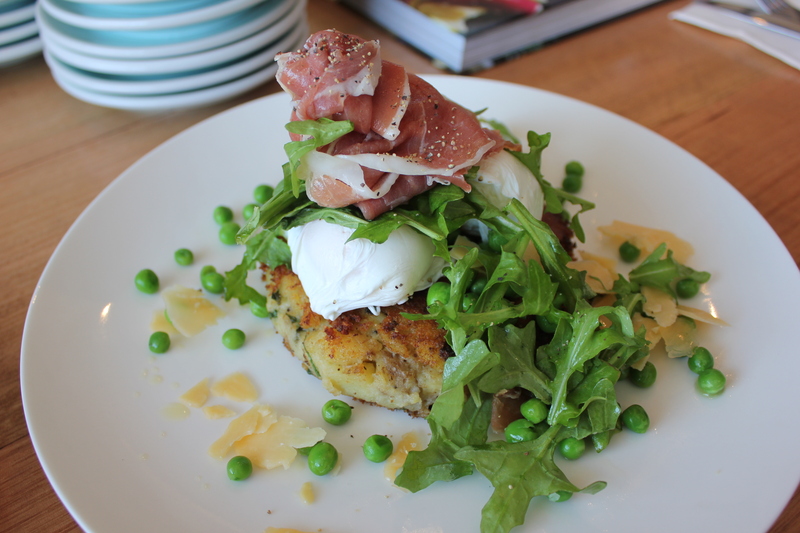 Mum had the Pix Plate ($18.90) which comprises of potato and herb hash, poached eggs, pea, prosciutto and parmesan salad with a drizzle of lemon oil. I sneaked a taste test of this dish and it was delicious! The potato and herb hash was crisp on the outside and inside was soft and fluffy. I really enjoyed how the prosciutto on top gave the dish it’s salty textures too. The poached eggs were cooked perfectly, oozing yellow liquid full of goodness. If you love your coffee, you are also in for a treat as Pixel serves good quality coffee to complement your food. With such a lovely ambience and friendly staff, I can’t wait to be back again to try some of their mouthwatering cakes. Oh, and I do hear they serve a good acai bowl too.